We just completed an incredible Global Coopetition with Muhammad Ali Center in January called MLK & ALI Games Five Days of Courageous Service. We are incredibly moved by all the light that is shed on the legacy of the Greatest Muhammad Ali and the constant catalyst this Center is in moving many into action. Mr. Ali’s life and way of being in the world was about love, compassion, and interfaith. 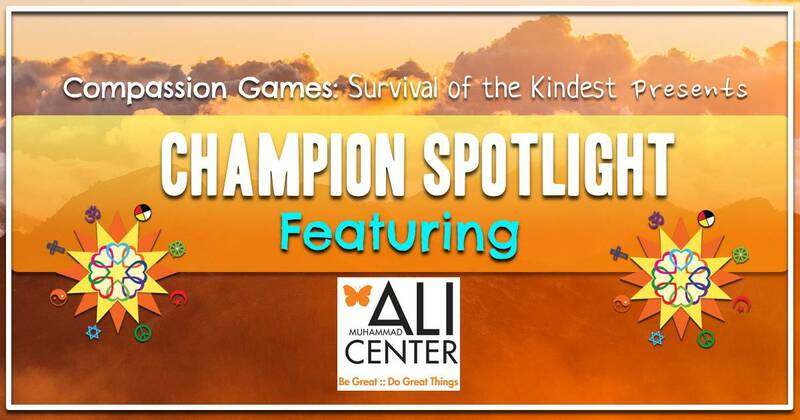 We would like to pass the torch of compassion today to the Ali Center. Thank you for lifting the world into courage and sharing the wisdom of Muhammad Ali. The Ali Center stands tall as a multicultural center with an award-winning museum, the Muhammad Ali Center captures the inspiration derived from the story of Muhammad Ali’s incredible life. A visit to the Center is not just an experience, but a journey into the heart of a champion. The Ali Center’s two-and-a-half levels of award-winning exhibits and galleries invite visitors to explore Muhammad Ali’s legendary life, as well as to reflect upon one’s own individual values, inner strength, character, and what makes you the greatest person you can be. Take a breathtaking journey through the Ali Center’s interactive and multimedia exhibits and discover the six core principles that Muhammad Ali embraced throughout his life: Confidence, Conviction, Dedication, Giving, Respect, and Spirituality. Learn how they gave him the wherewithal to be the best athlete he could be, the strength and courage to stand up for what he believed, and the inspiration to reach people around the world and dedicate himself to helping others. See Generation Ali Youth leaders share Muhammad Ali’s Six Core Principles in this amazing video. Check out the calendar of the endless inspiring events planned for 2017. Follow the Ali Center through Social Media as well below.